Bobby Hetterscheidt had orders from his mom to try to get the lucky blue penny that meant a full scholarship to Indiana State University. Crystal Jenkins had heard the ISU Foundation was giving away a college scholarship in conjunction with the Oct. 24 Blue and White Homecoming Parade and she wanted one of her sons to win it. Bobby attended the parade with his younger brother Jordan and his grandmother, Sandy Hetterscheidt. When a representative from the ISU Foundation handed Bobby a small card and he turned it over, he knew what he was looking for. "I yelled ‘I got the blue penny!'" 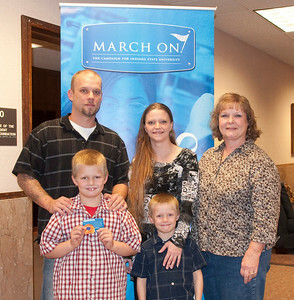 Bobby said when he arrived with his family at the ISU Foundation office to receive his award. Accompanying him to the presentation were his mother, father, Robert Hetterscheidt, brother, and grandmother Sandy Hetterscheidt. Sandy Hetterscheidt didn't really know what the blue penny meant at the timewhen Bobby received it, but she was certain to keep it safe among the candy in Bobby's bag. "We stood right at Seventh and Wabash for a good view of the parade," she said. "We were about the third or fourth family in line." "They called me at work and said ‘I got the blue penny,' " Jenkins said. When someone asked if Bobby always listens to her instructions that well, she smiled and said not always. But she was glad he did this time. She and the boys' father intend want for boththeir children to attend college. Bobby, a seven-year-old second grader at Lost Creek Elementary who enjoys riding four-wheelers, would be a member of the incoming freshman class of 2020. He hopes to be a police officer. "We have a great criminal justice program," Kevin Hoolehan, vice president of finance and controls for the ISU Foundation, said when he presented Bobby with a certificate and a bag of awards. "You need to get good grades to go to college," Hoolehan reminded Bobby. Looking ahead to four years of tuition for the years 2020-2024, the scholarship is expected to be valued at about $40,000. "Scholarships are at the heart of the ISU Foundation," said Gene Crume, foundation president. "As we launch the public phase of the university's first comprehensive campaign, we wanted to thank the community for its support by awarding this four-year scholarship to a youngster age 10 or under." March On! The Campaign for Indiana State University has a fund-raising goal of $85 million. To date, more than $47 million has been raised for the institution. The campaign runs through December 2011. For more information about the ISU Foundation, visit www.marchonisu.com or www.indstatefoundation.org. A 7-year-old Lost Creek Elementary School student was in the right place at the right time to help make an ISU education a lot more affordable for his family, thanks to the Indiana State University Foundation.